I tested the products in situ and I can tell you that from a first impression, the Bodylight Exfoliating Scrub is simply wonderful! My skin was so smooth after the exfoliation. The body lotion is light and feels refreshing and importantly, sinks right in without feeling sticky! The lemon scent is still very strong and that bugs me a little to be honest but it dissipates after a while. Garnier says that there will be visible lightening of the skin in 4 weeks with regular usage. They even handed out a ruler that measures the colour of the skin so you can compare. Well, I’m going to put them to the test – give me 4 weeks and I’ll be back to tell you if it really works or not! Garnier Bodylight Exfoliating Scrub and Whitening Hydrating UV lotion will be available in most pharmacies in Malaysia from mid November 2008.
i like their brightening face scrub and facial wash right from the beginning! ooo…I gotta give this a try – the lemon scent is a plus point for me though…I love lemon!! LOL.. I will be heading to local Watson’s to check these out!!!! Whitening scrub? sounds promising…:-) I think I need one now. Thanks for recommendation! You’re already very fair to begin with worrr… I’m curious to see how much lighter/brighter your skin will be! It has finally reached our shores, I have seen them in Singapore last year I think. Must admit the current Garnier products are either manufactured in China or somewhere unlike the earlier Garnier products which I saw in the stores in UK in 2002. Garnier is part of Loreal hence their range is slightly cheaper but with all the testing done at Loreal’s labs, there must be a certain degree of goodness in them. I love body scrubs! I’m there, dude. @Nikki : Let us know if you see it in PH! @Penelope:Hmm… so many people using the Garnier for face – I should try! @Natalie: Personally, I’m not expecting too much whitening! @celine: Yeah I remember seeing them in Singapore too. Garnier in Asia is produced for the Asian market so we aren’t seeing the same products/manufacturers that you see in Europe. I think its a pretty decent brand. 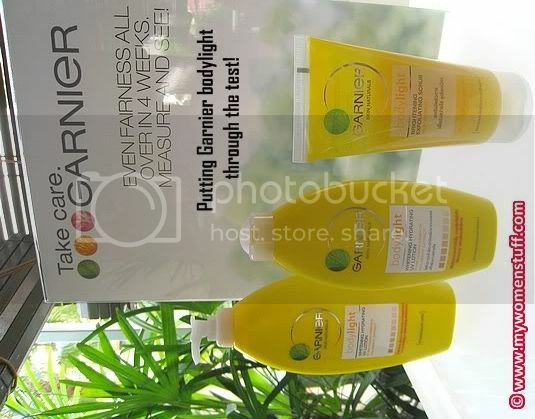 i certainly like this body lotion..my hubby like to smell the lemon essence from my skin..
plus my body felt really fresh n ready to be on the spotlight..so, u guys should go n buy it..
Can we use the Garnier Light Brightening Scrub Wash every day and night? I tried this product and I really love it so much. But to much disappointment, I couldnt get Garnier Body Scrub in Singapore anymore. I searched all Watson, PH islandwide and couldnt get it. Can anyone advise me where to get the Garnier Bodey Scrub? I have seen another scrub but is scrub wash, which I suppose is only meant for face. I am looking for Garnier Body Scrub please. does anyone know where i can buy this product i have searched everywhere i couldn’t find it. and which one should i get for body lighting .im lil confused or they just all come together? i would love to try it.